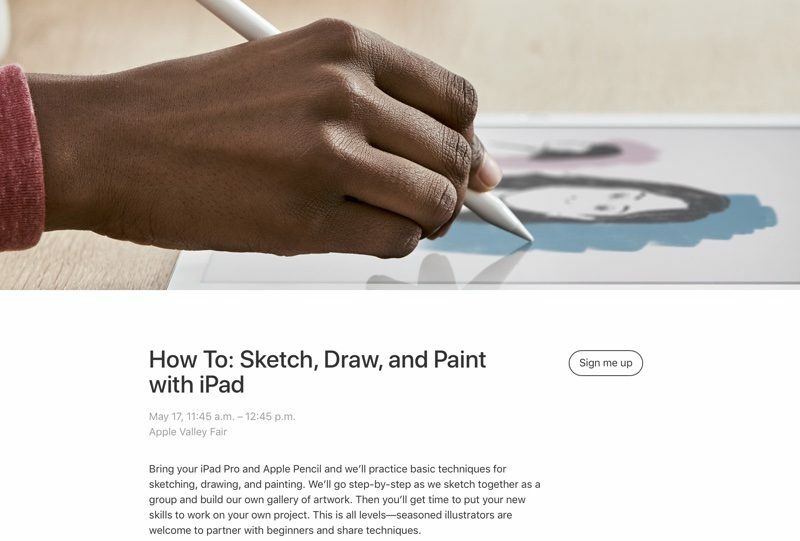 Apple in April announced plans to begin offering "Today at Apple" educational classes at all of its 495 stores around the world, and as of today, the company has launched a new website to allow customers to sign up for the sessions. More than 4,000 sessions are being offered each day this week across all of Apple's retail stores. The "Today at Apple" program, which has been in place at Apple's Union Square location since the store opened, offers a range of classes on topics like coding, art, music, design, and photography. There are classes designed for both beginners and more experienced users, as well as classes for all ages, including children. Most sessions are taught by trained employees known as "Creative Pros," but in select cities, there are classes taught by well-known artists, photographers, and musicians. 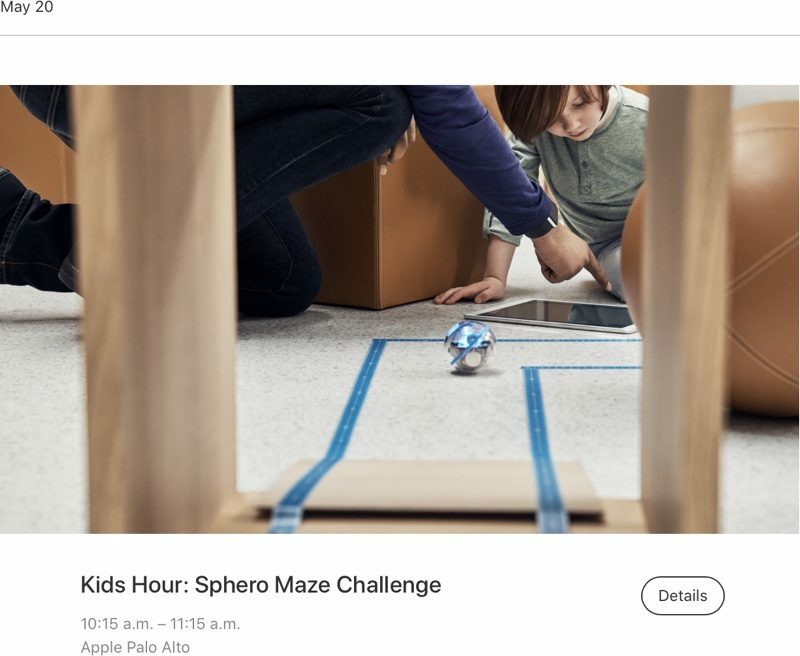 Session content will vary across different locations, but all 495 of Apple's retail stores are expected to offer "Photo Walks" and "Kids Hour" sessions by May 20. Today at Apple classes focus on everything from basic iPhone, iPad, and Mac skills to more advanced topics like mixing music on a Mac, editing photos on an iPhone, and drawing on an iPad. There are also "Studio Hours" where customers can bring in personal projects and get help from Apple staff. Most sessions are an hour in length, with the exception of Studio Hours, which last for an hour and a half. Apple Store chief Angela Ahrendts says the "Today at Apple" classes are designed to turn Apple locations into a "modern-day town square" where everyone is welcome to "discover a new passion" or take a skill to the next level. "We think it will be a fun and enlightening experience for everyone who joins," she said in a statement when the program was announced. Even more pretentious is teaching useless skills like art. I'd be okay if they taught actual useful skills like being a doctor or lawyer or engineer. What an extraordinarily sad comment. ....at a store? You're saying that you want to learn how to be a doctor or lawyer...from a retail store? Apple trying to sell more products. Oh the horror. Btw, there might be people who already have an iPad Pro and pencil but aren't great drawers (you can use the pencil for other things) that would be interested in a class like this. The only thing pretentious is your post. WHERE ARE THESE APPLE STORES WITH ALL THAT ROOM???? I'm not going anywhere unless there's coffee. Doc: Don't worry. I studied medicine at the finest Apple retail store. Me: Oh, **** **** **** **** **** **** ****. Interesting. I like that they are trying something different. Will it work? Only time will tell. Seems experiencing it personally is the best way to evaluate if Apple's plan works or not. I have just registered a Photo Walk session of coming Sat in HK. Edward Barnieh introduced his pics (mostly taken with iphone) and ways to look at cities. Group of about 10 (excluding apple staff) were then lead to two spots at Causeway Bay. At the end, a brief editing session with VSCO completed the photo walk. You couldn't have been more wrong from how you completely misinterpreted my post. I didn't go past anybody's understanding. I have no idea what you're talking about. I was NOT being sarcastic and I was legitimately being serious that I would actually participate in one of the tutorials offered from Apple in photography. Again, I think it be a benefit for someone like myself who wants to expand and utilize my iPhone 7 Plus. Don't worry. Your original post did not come across as sarcastic in the least. Not sure what the other poster is rambling about. Maybe they quoted the wrong poster.